The Australian Industry Group report “The quest for a level playing field: the non-conforming products dilemma”, provided compelling evidence on the increasing risks of Non-conforming Products in Building and Construction projects. The ACRS website is www.steelcertification.com. This provides the technical detail on the ACRS scheme and lists the firms who are certified to comply with Australian and New Zealand construction steel product standards. The new website www.steelcompliance.com is designed to provide information on steel compliance. 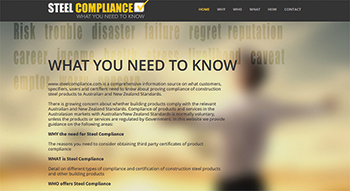 This is a comprehensive information source on what customers, specifiers, users and certifiers need to know about proving compliance of construction steel products to Australian and New Zealand Standards.